Lounging by the pool is an activity all mammals seem to enjoy. WHAT ARE SOME of your favourite ways to cool down? A refreshing ice pop? Maybe a dip in the pool? Or how about a frozen slab of horse meat? These are just some of the methods the keepers at Dublin Zoo use to keep the residents there cool and content. We popped in to meet Gerry Creighton, operations manager for animals and grounds, and see first-hand how the tigers, elephants, and orangutans stay cool. 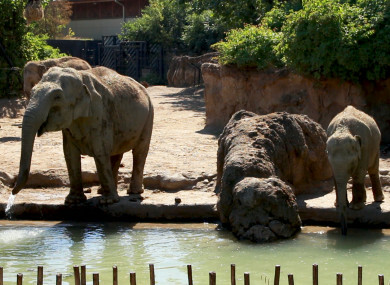 Email “Ice pops and mud baths: Keeping Dublin Zoo's residents cool in the heatwave”. Feedback on “Ice pops and mud baths: Keeping Dublin Zoo's residents cool in the heatwave”.